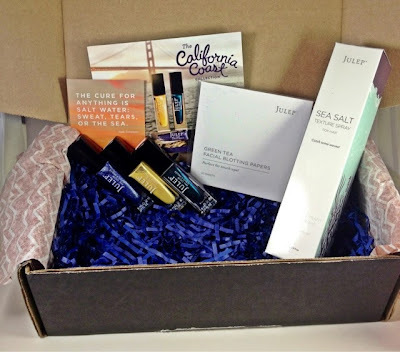 My July Julep Maven box has arrived! Last July I remember being bummed. They had two limited colors for 4th of July and one for Canada too. I added on the colors but since add ons shipped separately I didn't get them until after the 4th and I missed out on the celebration. Thats not an issue anymore! This month Julep started shipping add ons in the same box as your monthly Maven products! Hip hip hooorayyy! No more waiting and extra week for the rest of my products. This month I switched from bombshell to the it girl box. I wasn't interested in their Beach Tonic skin oil since I"m so pasty white I never go outside in the daytime. 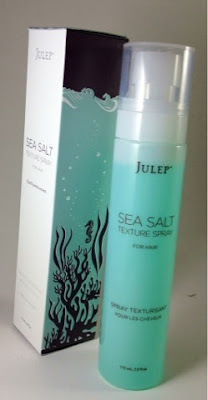 Instead of getting the product I went for more polish and got the Sea Salt Texture Spray as my add on. 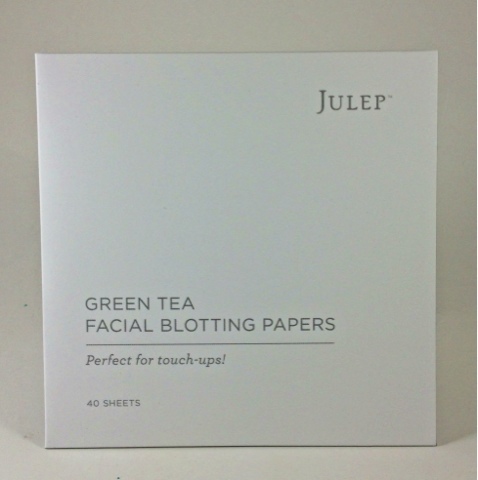 This months extra is a pack of 40 Green Tea Facial Blotting Papers. My colors this month were Tracy, Nadia and Angela. The Sea Salt Texture Spray can be used on hair damp or wet and gives you sun kissed, beach waves! I used it before going out and scrunched my hair up nice. It gave me some pretty nice waves all night! 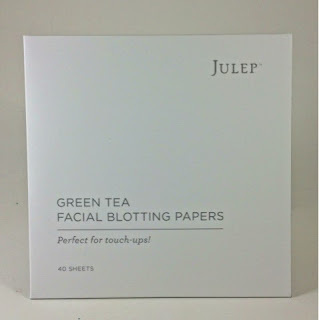 Juleps Green Tea Facial Blotting Papers are pretty amazing. I never thought I had oily skin until I used these! My new job has been sucking up all my time. I threw these in my lunch bag and used them when my day was halfway over. I couldn't believe how much oil these things slurped up. I felt nice, light and refreshed after using them and the added kicker was that they left my makeup perfectly in place. Did I mention these have a wonderful sweet, green tea scent? Mmmmmm. Julep Angela was a two coater for me. This duo chrome shifts from blue to teal to purple at extreme angles. I really liked this one. It is pretty unique! Julep Nadia is a golden, frosty, pale yellow. This was a three coater and I could still slightly see my nail line through it. I like the color but yellows just aren't flattering on my skin tone. 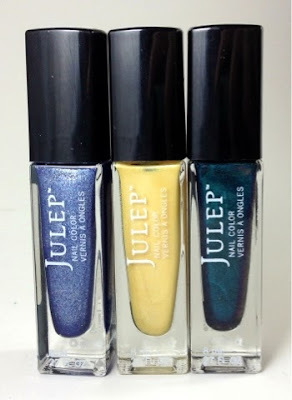 Julep Tracy is a sea salt finish! I had no idea. Juleps Sea Salt line is their textured polish. This is a super sparkly ocean blue that is matte when dry. For more variation, you can always a top coat to gloss and sparkle it up. Overall I loved this box! If you are interested in signing up for your own Julep Maven box is it $19.99 a month (the value is always way more than that!). Just go here and use the code FREEBOX at checkout. 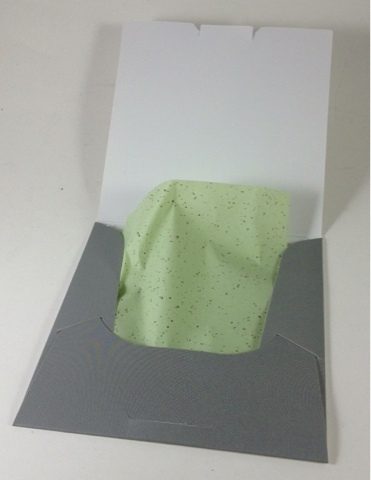 You will get your first box totally free. If you're not happy you can always cancel at no penalty and keep the box, or you can become a Julep addict like me who has been getting Julep for the past year and three months.